Little Mermaid Wallpaper is an excellent quality hand drawn Disney character, post processing done in Adobe Photoshop. 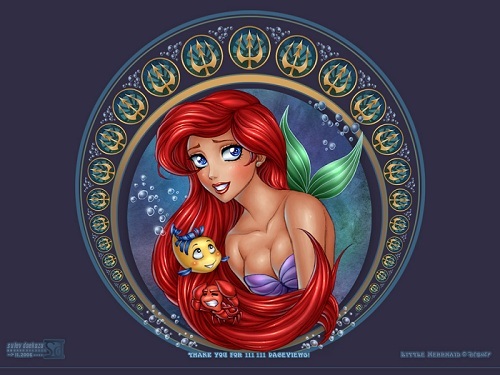 Little Mermaid Wallpaper is created by daekazu using Pen, Ink and Photoshop. 1024Ã—768 pixels ; resize if needed. It is a JPG download, the file is very light, only 293 KB in size. This Article Has Been Shared 4979 Times! Cute Red Flower Wallpaper is an excellent quality photo wallpaper of a bunch of Red Flowers with fantastic depth of field. Cite this article as: Abhishek Ghosh, "Little Mermaid Wallpaper : Colorful Hand Drawn Fantasy Wallpaper," in The Customize Windows, May 17, 2012, April 24, 2019, https://thecustomizewindows.com/2012/05/little-mermaid-wallpaper-colorful-hand-drawn-fantasy-wallpaper/.